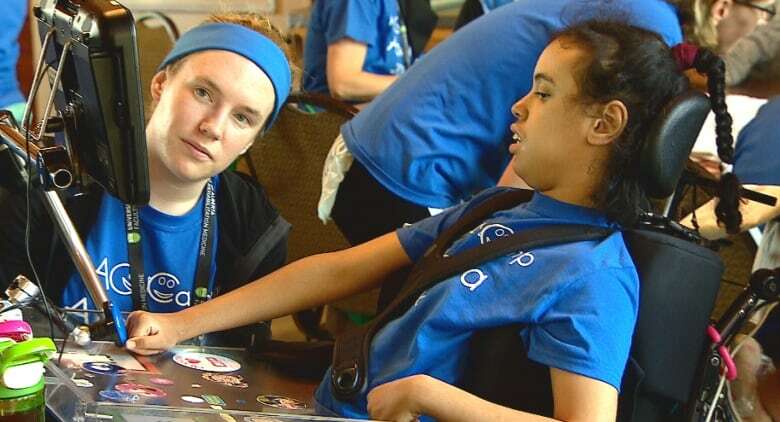 A new camp held west of Calgary recently focused on helping young people who use augmentative and alternative communication learn how to communicate better. Ebony Arbeau describes her sister as having a wrecking ball inside her head. Melody-Anne Arbeau is 14 years old and has cerebral palsy. She is non-verbal, tube-fed and in a wheelchair — but that doesn't stop her from letting others know how she feels. "I feel excited/happy to meet new friends [at AAC Camp]," she says through her augmentative and alternative communication device. Otherwise known as an AAC device, it was the common factor among dozens of young people attending the Easter Seals camp west of Calgary last week. Campers and their caregivers were given a chance at the typical summer camp experience. They did arts and crafts, swimming, archery and even a treasure hunt. Researchers from the University of Alberta's rehabilitation medicine department were also on hand to help them learn how to communicate better. It was also a chance to make friends who have a similar issues and needs. "They're just like everybody else. They're not the one that's different," said Karen Pollock with the University of Alberta. The goal is to help the campers come out of their shells and learn how to communicate in a group setting. "Imagine all the words inside of them are piling inside them," said Ebony Arbeau, who attended the camp with her sister and parents. The 11-year-old says Melody-Anne has inspired her to pursue a career in developmental aid. She was hoping to learn more about the AAC devices and the challenges facing those who use them. "Kids with devices are only limited to what they have on the device," she said. "That's why they start crying, cause they can't say what they need to say." She says all kids have potential to be great. "I think they have more perseverance and are stronger than us mentally because a lot of people couldn't survive a day without talking, let alone a whole lifetime," said Ebony. The camp was held from Aug. 26-29 just south of Bragg Creek, Alta. It was held in partnership with the University of Alberta's department of communication sciences and disorders and March of Dimes Canada.